St. Peter & St. Paul teach us to embody faith. I couldn’t help but shout joyfully! The kiddos rolled their eyes and shook their heads at me. Hundreds of pounds of kale at the food bank needed to be sorted into appropriate portions to be handed out to clients. Food banks often need volunteers to sort enormous pallets of kale, apples, and other produce donated from local farmers. I find that sorting donations at a food bank is actually a lot of fun: music, dancing, jokes, and laughter make for joyful work. It also feels right and good, putting flesh and bones on the words we pray and the lessons we learn inside the walls of the church. The Feast of St. Peter and St. Paul celebrates the two evangelistic icons of the early church. The origins of this shared feast day point to their common martyrdom in Rome, Peter in 64 CE by inverted crucifixion and Paul in 67 CE by beheading. Peter and Paul also have a commonality in the beginnings of the journeys following Jesus. When Jesus calls Peter, he says, “Come, follow me.” To Saul (soon to be Paul) on the road to Damascus, the risen Jesus says, “Now get up and go.” Following Jesus has a kinetic nature to it for each. Discipleship in the way of Jesus is kinesthetic. It requires movement. Discipleship engages the body; learning is tactile and engaging. Life in the way of Jesus is an embodied faith. 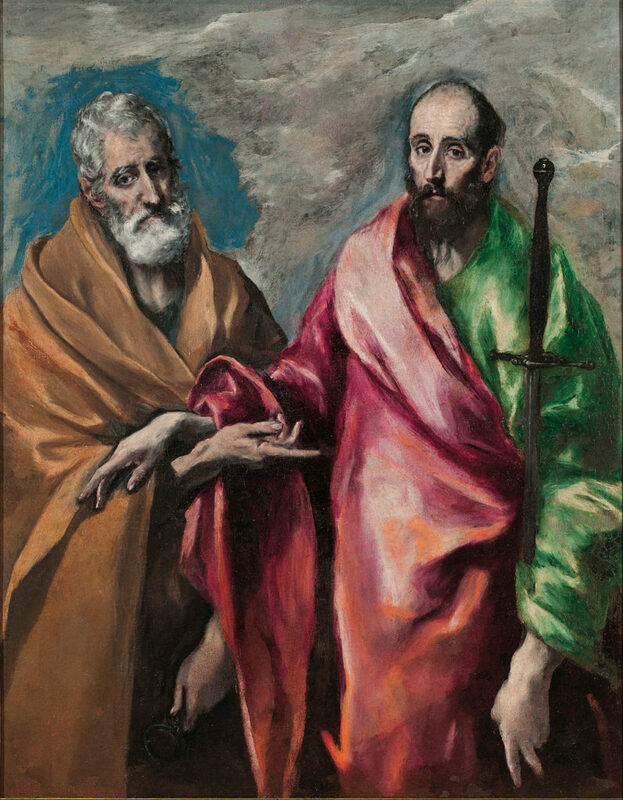 Saint Peter and Saint Paul, by El Greco. Public Domain via Wikimedia Commons. When Jesus called Peter to follow, Peter stepped into a way of life that was lived on the road, in the world, and amongst people. With Jesus, Peter and the disciples fed the hungry, healed the sick, reached out to the lost, and loved the broken. The journey took them to villages, on mountains, throughout the countryside, on boats, and into remarkable situations. When Jesus called Paul, Paul embarked on a journey of preaching and engagement with communities. His missionary travels took him far and wide. Paul wanted to share his experience of the risen Jesus with as many people as possible. His feet took his message from Arabia to Spain. Like Peter and Paul, our life in the way of Jesus is lived out through our bodies. From worship to service, we have ample opportunities to walk beside and with our kiddos and be formed together by the movements and sensations associated with our tradition. Our liturgy is kinetic and tactile, engaging the fullness of our senses. We kneel, bow, and make the sign of the cross. Prayers soak our hearts, and hymns ring in our ears. We watch the prayers of incense rise as the smell of holiness fills our spirits. We see bread blessed and broken, we drink from the cup of salvation, and we eat the bread of heaven. What we do in worship and how we pray shapes our beliefs and how we live out our lives in faith. Faith lived out through service requires movement outside sanctuaries also. From preparing meals in soup kitchens to doing laundry in a laundromat, from painting and hammering at construction projects to sorting food donations at food banks, we engage in discipleship that is kinetic and tactile by nature. When we serve as families and communities, we model how love for another intimately dovetails with our love for God. Worshiping together and serving alongside my kids at food banks, soup kitchens, laundromats, and construction sites has helped us to develop a deeper sense of God’s calling in our lives and what it means to live life in the way of Jesus. The kinesthetic nature of an embodied faith drives home in particular ways that we fulfill the law of Christ when we help carry the burdens of others. 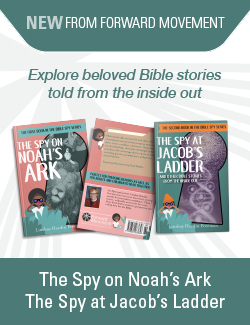 Martyrdom is a difficult, and probably scary, topic to explain to children. However, on this Feast of St. Peter and St. Paul, we can also explain sacrifice with a different approach. Sacrificial love is an embodied faith lived for the benefit of other people. As disciples and parents, we have the incredible opportunity to practice living it out together with the next generation of disciples, side by side. Tired feet and dirty hands make for a joyful heart and a soul that overflows with God’s love and grace. Can I get a “Kale yeah”?! How do you participate in a kinetic, embodied faith alongside your children and teens? When you hear Jesus call to you, “Come, follow me,” how might you engage and model an embodied faith that is a habit and way of life?